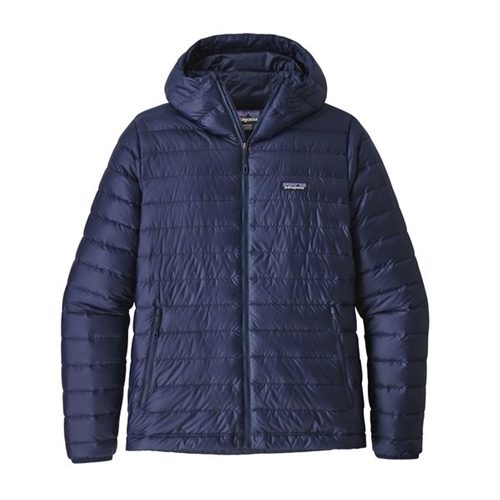 Patagonia's ethically sourced and traceable down is one major reason to buy this jacket, if you are in to environmental concerns at all then you will realize Patagonia has some of the most ethical down on the planet. The 800-fill-power down is more than enough to keep you warm in any situation and a windproof/water-resistant shell with a DWR (durable water repellent) finish make this jacket a win-win. Two zippered handwarmer pockets are sure to keep your fingers toasty and an interior zippered chest pocket is perfect for stashing valuable as well as doubling as a stuffstack. The single pull adjustable hood provides adequate protection and the drawcord hem around the waist keep heat in tight. Jacket: Mens Size M Warmth: 5 Stars. I tested this out in the brutal and windy conditions that Chicago has to offer and I was warm with minimal layering underneath. Fit: 3 Stars. The chest area and sleeves fit me like a glove, but the jacket has a fairly drastic taper (around 1.5 inches from chest to bottom hem) and I found it almost impossible to even zip up. It is important to point out I stand 67 inches tall and have rather large hips and glutes so this issue might not affect you if you stand taller and have a more slender build. (Also important to point out that the size L was too big for my preference, but did fit significantly better) Return Process: 5 Stars. I contacted Hannah and within minutes she had a RMA number ready for me and instructions for how to send the item back. Once the jacket was received by the PRFS staff, I had a refund to my credit card within 2 days. The process was painless and very easy by all accounts. MY husband loves it! He wears it every day. ...and looks nice to. The Patagonia Men's Down Sweater Hoody is perfect for cold weather days no matter the activity or meeting, this Down Sweater Hoody for men has all the features you'd expect from Patagonia and I really like the way it looks on me too which is great.